The side lugs shape is taller with no ramps, which along with a softer rubber compound, helps give the Vee Crown Gem a little extra bite. 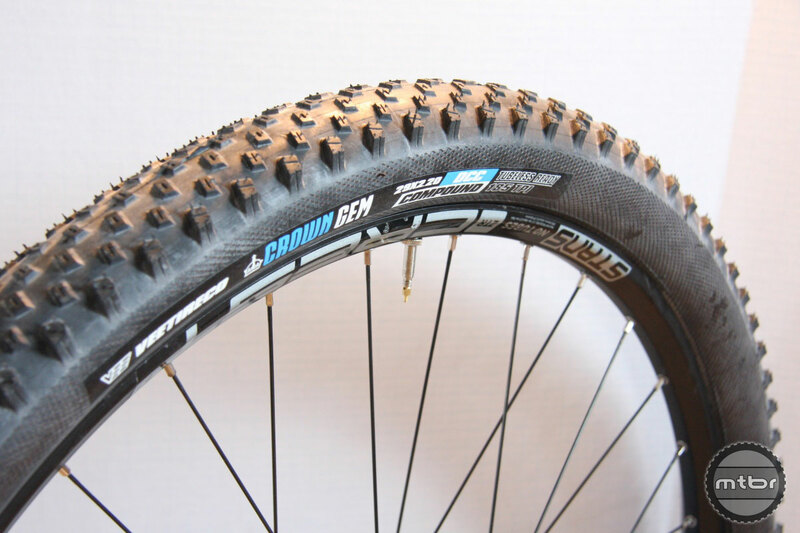 Designed with input from former gravity pro Mike King, the 185 tpi Vee Crown Gem is billed as an all-purpose tire that’s at home racing XC or just rallying singletrack. Taller side knobs improve cornering control, while a lower profile center knob pattern helps maintain speed. 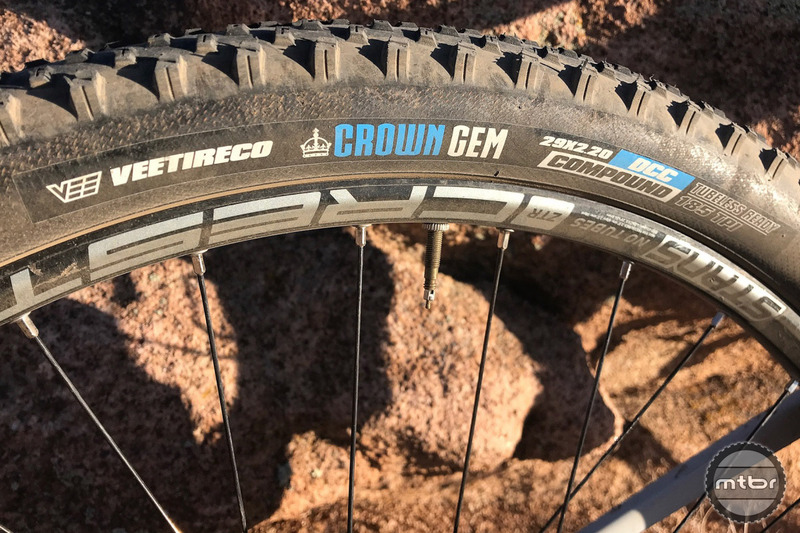 The Vee Crown Gem also boasts what the tire maker calls its Synthesis sidewall, where a specially woven lightweight layer gives additional puncture and cut protection. 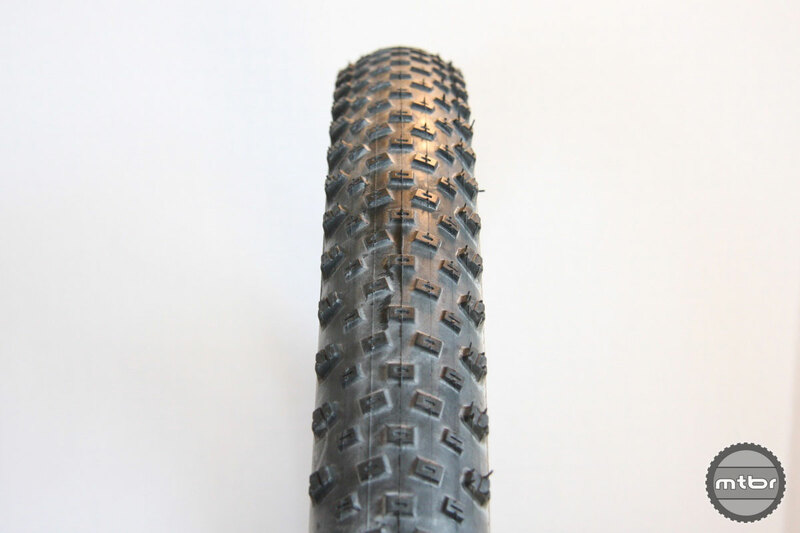 It’s a design adapted from Vee’s road tire line and is lighter than their standard MTB casing. All told, the Vee Crown Gem comes in eight sizes, including 26×2.26; 27.5×2.25, 2.35, 2.6, 2.8 and 3.0; and 29×2.2 and 2.3. 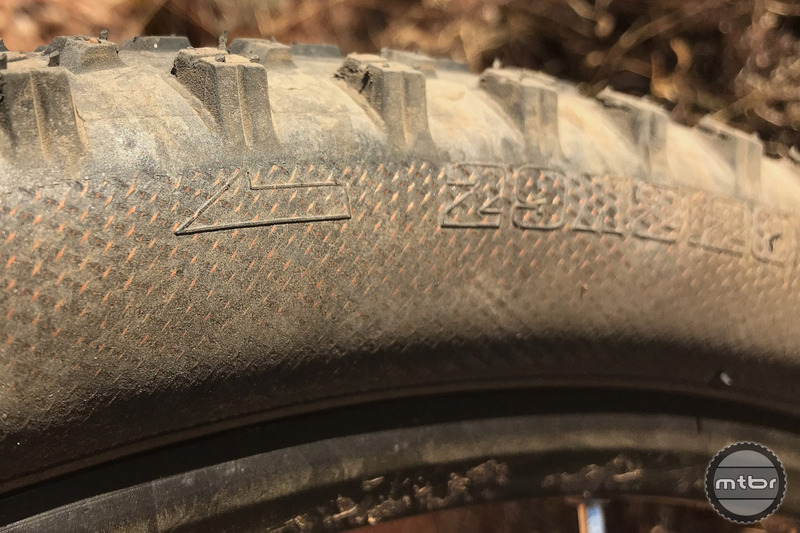 Mtbr tested the 29×2.2 version that features their DCC dual compound construction where harder 56 A rubber is used on the center tread to increase durability, but softer 48 A mix is applied on the sides for more cornering grip. Dry conditions cross-country is the Vee Crown Gem’s strong suit, but it can also handle a little rowdy riding. On the Mtbr Park Tools DS-1 Electronic Scale the Vee Crown Gem weighed 726 grams (4g less than claimed weight). 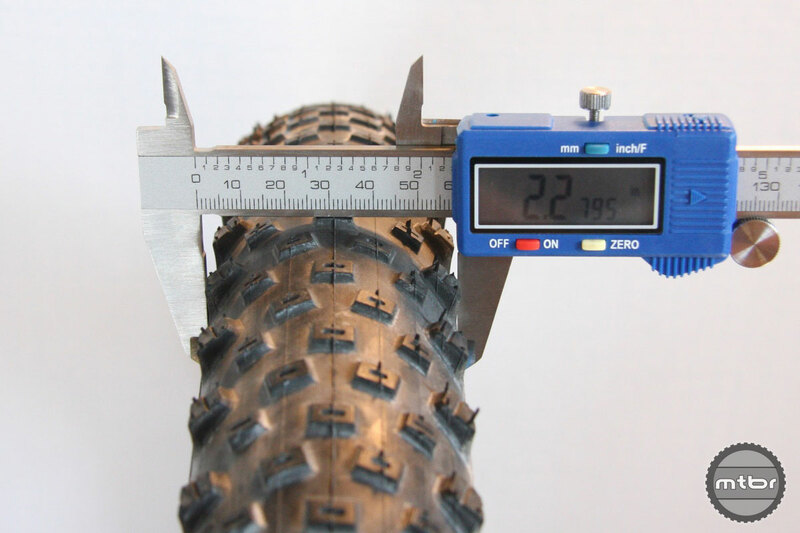 When mounted on a Stan’s ZTR Crest S1 aluminum wheels, which have a 23mm internal rim width, actual tire width measured by the Park Tools DC-1 Digital Caliper was 2.28 (versus the advertised 2.2). 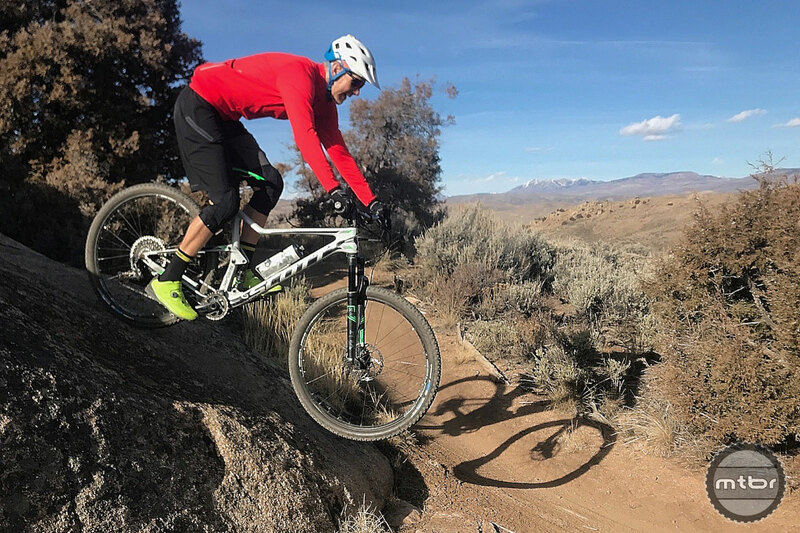 Mtbr tested the Vee Crown Gem on a variety of trail types, including hardpack, loose over hard, and rocky alpine terrain. 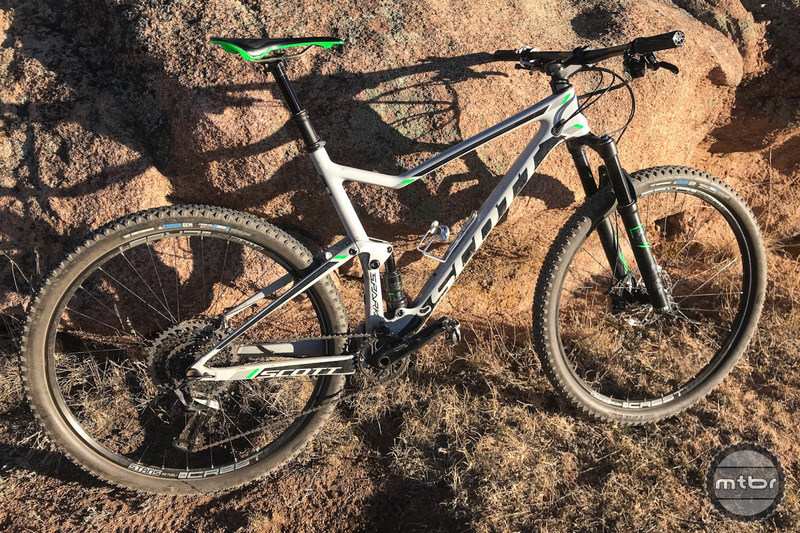 Our test steed for this tire review was this 2017 Scott Spark 900 29er with 120mm of suspension front and rear. You can read the Mtbr review of this bike here. The Vee Crown Gem has a predictable and smooth transition from center to sides. 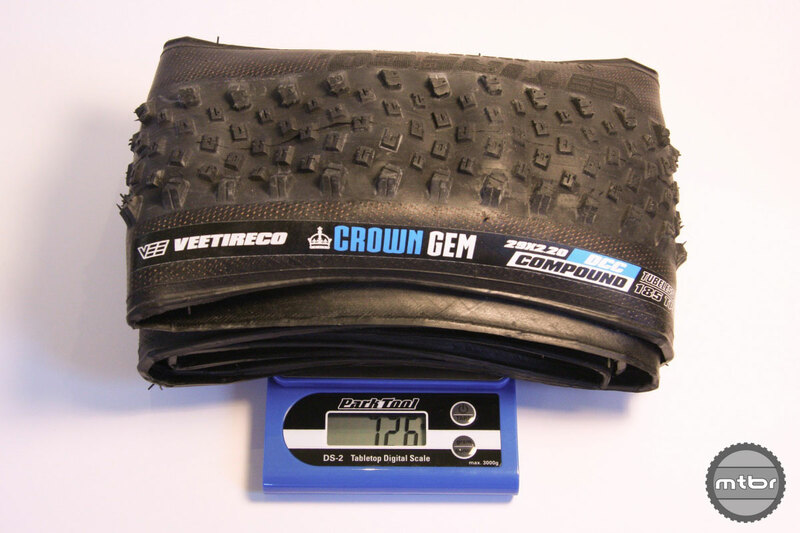 Take a look at the number of sizes and widths of Vee’s Crown Gem, and it’s clear this is a tire with all-around ambitions. But examine the tread layout and shape, and it’s also apparent that dry conditions cross-country riding is the Vee Crown Gem’s strong suit. With its low profile, moderately spaced center knobs, this tire is built for speed — but not muddy or wet days. And while it’s not quite as straight-line quick as the Vittoria Mezcal, with its near continuous center tread, the Vee Crown Gem is no dog when going fast is the primary objective. The repeating three-lug pattern features speed-enhancing ramped square-shaped knobs with center cut-outs to improve braking performance. There was some tread wear during testing of the Vee Crown Gem. In the transition zone, tread shape is similar, but the knobs are slightly shorter, allowing the tire to ease its way into corners in a predictable manner. Once leaned over, the side lugs take over. Here the tread shape is taller with no ramps, which along with a softer rubber compound, helps give the tire a little extra bite. 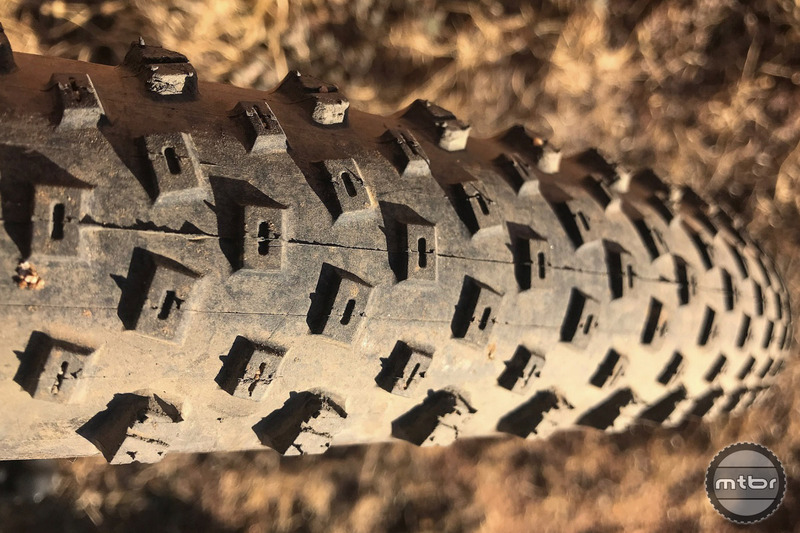 Add it all up, and Mtbr found the Vee Crown Gem to be a solid all-around tire that was plenty fast, but also offered a decent amount of cornering grip, even when pushed hard on loose kitty litter terrain. Transition from center to side tread is smooth, and once at an angle, this tire was surprisingly capable. No, you don’t want to mount one of these on the front of your trail bike. 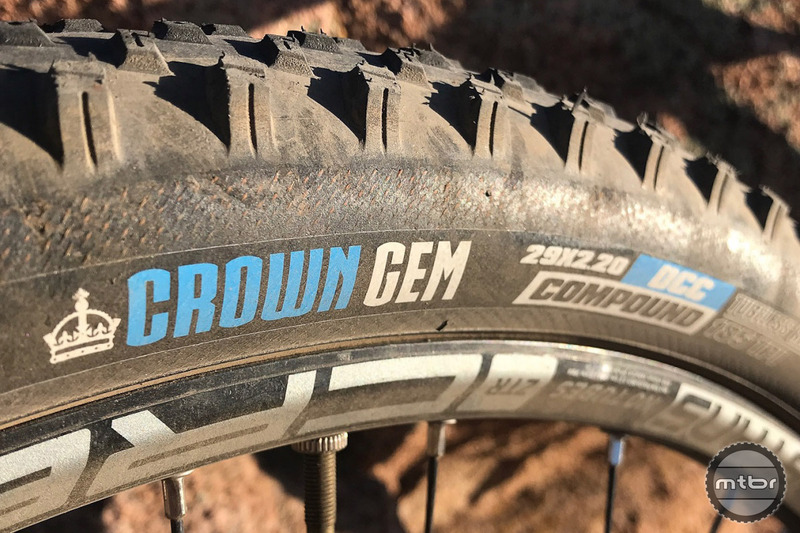 But for dedicated XC riding, or as a speedy rear tire option, the Vee Crown Gem is legit contender with a consumer-friendly price. Easy to spot rotation indicator arrows should be required on all tires. 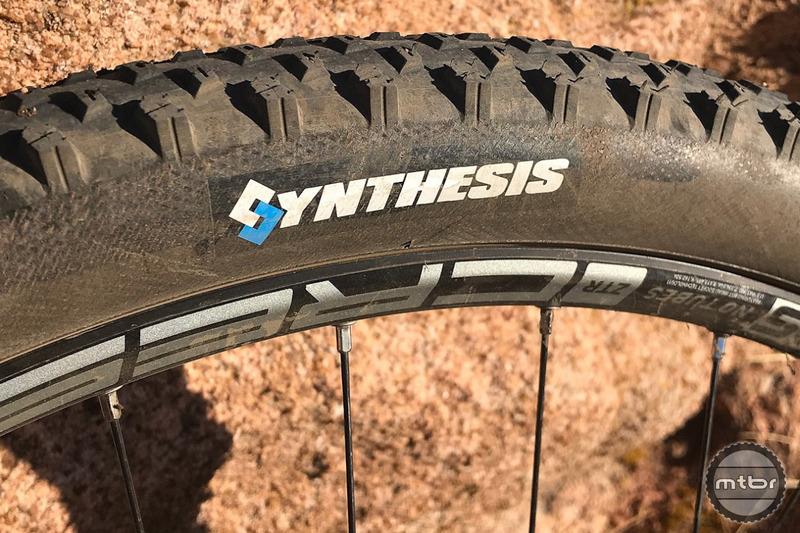 This tire’s Synthesis sidewall also gets high marks, showing very little wear despite being pushed hard on the sandstone laden trails of Gunnison, Colorado’s Hartman Rocks, which is notorious for chewing up wimpy rubber. We also loved the fact that the direction arrow is reasonably easy to spot. Why all tire makers don’t do this is a mystery. The Vee Crown Gems also bucked the common trend of failing to live up to weight and width claims. This tire was actually lighter than advertised (726g versus 730g) and wider (2.28 versus 2.2). That little bit of extra girth was especially appreciated when test rides ventured into more rowdy terrain. On the Mtbr Park Tools DS-1 Electronic Scale the Vee Crown Gem weighed 726 grams (4g less than claimed weight). On the downside, there was some accelerated wear on this single ply 185tpi offering, especially on the side lugs of the rear tire. This isn’t surprising given the fact that the Vee Crown Gem features their DCC dual compound construction, where harder rubber is used on the center tread, but a softer mix is applied to the sides. 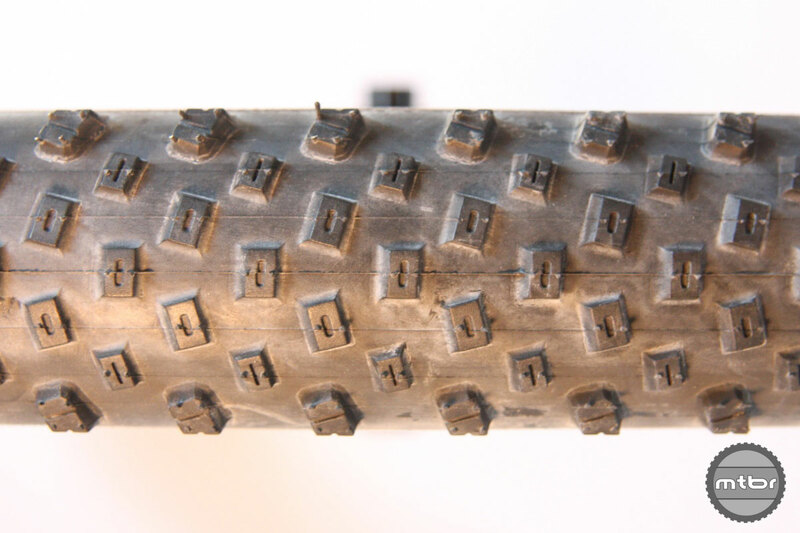 But if you ride exclusively on rocky/rough terrain, you may want to look for a tire with more robust tread durability. 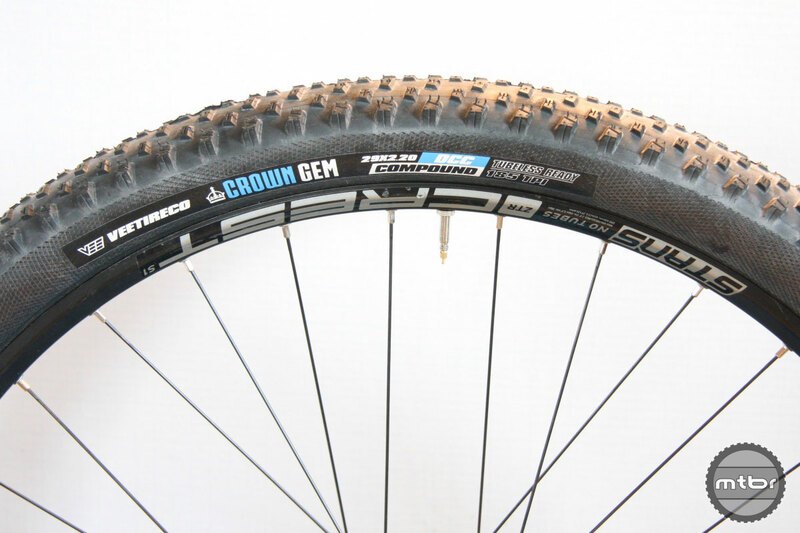 The Vee Crown Gem was also the trickiest tires in this shootout to set-up tubeless. After repeated failures with a dual chamber tubeless-specific floor pump, we had to resort to seating one bead with a tube installed, and then circling back with the floor pump. Once on, though, air loss was minimal and they never burped while being run in the 24-26psi range on a set of Stan’s ZTR Crest S1 aluminum wheels with a 23mm internal rim width. When mounted on a Stan’s ZTR Crest S1 aluminum wheels, which have a 23mm internal rim width, actual tire width measured by the Park Tools DC-1 Digital Caliper was 2.28 (versus the advertised 2.2). Bottom line, this is a good (but not great) all-around tire with an attractive price and impressive puncture resistance, that also rolls fast and grips better than expected when cornering. Just don’t expect it to last forever or be a top performer on your trail bike. The side lugs shape is taller with no ramps, which along with a softer rubber compound, helps give the tire more bite. Dry conditions cross-country riding is the Crown Gem’s strong suit, but it can also get a little rowdy. In the transition zone, tread shape is similar, but the knobs are slightly shorter, allowing the tire to ease its way into corners in a predictable manner. With its low profile, moderately spaced center knobs, this tire is built for speed. The Crown Gems have a predictable and smooth transition from center to sides. There was some tread wear during testing. On the Mtbr Park Tools DS-1 Electronic Scale the Crown Gem weighed 726 grams (4g less than claimed weight). The little bit of extra girth was appreciated when venturing into more rowdy terrain. The Crown Gems were the least expensive tires in test. The repeating three-lug pattern features speed-enhancing ramped square-shaped knobs with center cut-outs to improve braking performance. Hopefully Vee Tires has fully addressed the known issue of the Crown Gem ripping cornering knobs off through the casing. This was a common issue with this tire in the past, but Vee says it’s been addressed. I tried a Crown Gem some time ago with the torn knob issue and Vee customer service bent over backward to be helpful in replacing my tire.